Yaoundé (Agenzia Fides) - Another priest was killed in one of the two English-speaking regions of Cameroon. Fr Cosmas Omboto Ondari, a Kenyan missionary belonging to the Missionary Society of St. Joseph of Mill Hill, was killed in the early afternoon yesterday, November 21st, in Kembong, a few kilometers from Memfe. Fr. Cosmas was killed by a military patrol while he was in front of the church of St. Martin of Tours, where he was the parish priest. The missionary died immediately. Father Cosmas, who was about thirty years old, was ordained on March 26, 2017 in Kisii, Kenya, together with two other confreres by His Exc. Mgr. Joseph Mairura Okemwa, Bishop of Kisii. The missionary was immediately sent to Cameroon, first to St. Jude parish of Fundong in the north-western province and then to the area of Mamfe. Fr. Cosmas is the second Catholic priest killed in the south-eastern English-speaking region. On 20 July, Fr. Alexandre Sob Nougi, 42, parish priest of the parish of the Sacred Heart in Bomaka, in the diocese of Buea (see Fides 23/7/2018) was killed. 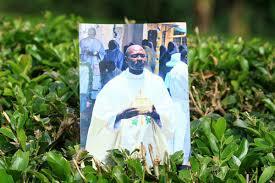 On 4 October a seminarian, Gérard Anjiangwe, had been killed in circumstances similar to those of Fr. Cosmas. The 19-year-old was shot by a military squad while he was in front of the parish church of Santa Teresa in Bamessing, a village near Ndop in the Ngo-Ketunjia department of northwest Cameroon (see Fides 16/10/2018).